When Star Wars: The Force Awakens finally hit theaters over the weekend, it gave fans the answers to several questions they've been waiting many years for. However, it also posed even more questions that fans will be pondering as we now begin the countdown to Star Wars: Episode VIII, which starts production next year and is set for release on May 26, 2017. Over the weekend, director J.J. Abrams and screenwriters Lawrence Kasdan and Michael Arndt held a post-screening Q&A, attended by Entertainment Weekly, where they shed some new light on the beloved Star Wars droid R2-D2. There will be SPOILERS revealed below, if you haven't seen Star Wars: The Force Awakens yet, so read on at your own risk. We first see R2-D2 towards the middle of Star Wars: The Force Awakens, when Han Solo (Harrison Ford), Chewbacca (Peter Mayhew), Finn (John Boyega) and BB-8 arrive at the Resistance base. They learn from C-3PO (Anthony Daniels) that R2-D2 has been stuck in a "low power mode" for several years, in the aftermath of Kylo Ren's (Adam Driver) betrayal of his Jedi teacher, Luke Skywalker (Mark Hamill). As it turns out, though, Michael Arndt, who wrote the first version of the script before J.J. Abrams and Lawrence Kasdan came on to co-write the script, revealed that he originally had R2-D2 and C-3PO arriving together. "I had originally written R2 and C-3PO showing up together, and Larry very intelligently said, 'You want to keep them separate from each other.' And of course I'm like, 'No, no, no, Larry. You don't get it at all!'" Michael Arndt added that he later realized R2-D2's arrival needed to be presented as "delayed gratification," building up the audience's expectations before he finally came back to life. During the first scene where we see R2 in his low-power coma mode, BB-8 approaches and says something to R2, which isn't met with a response. At the very end, after the First Order has been destroyed, R2 comes back to life, revealing the Jedi temple map, which BB-8 completes with the missing piece. Here's what director J.J. Abrams had to say about this critical scene, adding how he felt it was necessary to bring R2 back to life, shortly after the death of Han Solo. "BB-8 comes up and says something to him, which is basically, 'I've got this piece of a map, do you happen to have the rest?' The idea was, R2 who has been all over the galaxy, is still in his coma, but he hears this. And it triggers something that would ultimately wake him up. While it may seem, you know, completely lucky and an easy way out, at that point in the movie, when you've lost a person, desperately, and somebody you hopefully care about is unconscious, you want someone to return." 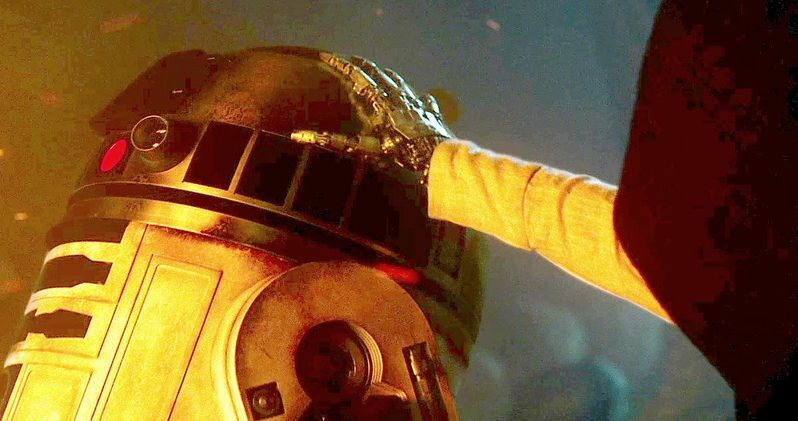 There is also speculation that Luke Skywalker himself caused R2-D2 to "wake up" at just the right time, but that theory wasn't addressed by the director and writers. However, they did touch on how R2 actually gets a hold of this map in the first place, which ties into the movie that started it all, 1977's Star Wars: Episode IV - A New Hope. In that movie, there's a scene where R2-D2 accesses the original Death star's database to find information on how to save Princess Leia, and it's there that R2 came across this map, according to Michael Arndt. J.J. Abrams added that this is referenced by the villainous Kylo Ren. We know at the beginning of the movie that Poe Dameron (Oscar Isaac) travels to Jakku to retrieve an important piece of data for the Resistance from Lor San Tekka (Max von Sydow), which he stashes inside BB-8 after The First Order attacks. This data turns out to be the missing piece of the Jedi temple map, but what remains unclear is how Lor San Tekka came across this data himself. What do you think about these new details? Stay tuned for more on Star Wars: The Force Awakens as more details continue to be unveiled.